Model: 2240B. Will there be a dock or forklift. Prefer to pick it up yourself?. Your zip code. BULLSEYE INDUSTRIAL SALES, LLC. Fluke Y8103. Bead Thermocouple. 0 to 500° F, 48" Length, Type K.
Fluke Y8102. Type K Thermocouple Probe. Fluke 80PK-4 Type K Thermocouple, -196°C to 816°C Temperature Probe, New! Fluke 80PK-4. Type K Thermocouple. -196°C to 816°C. Temperature Probe. Fluke 1722A/AP. For use with Fluke 1722A/AP. Corded, 3 Button. For use with Fluke 9100A / AF. 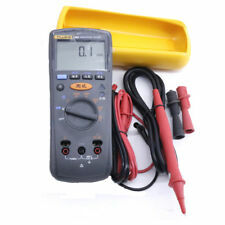 Fluke 9132A-024. 24-Pin ROM Module. Fluke A3001 FC Features Fluke Connect A3001-FC iFlex AC Current Module. Fluke Connect-enabled wireless iFlex AC current module. The A3001-FC has a logging capacity of up to 65,000 readings. Range 0.5 A to 2500 A AC. FOUR STARS IS LIKE NEW OR IN EXCELLENT CONDITION. TWO STARS IS WELL WORN, BUT WE THINK IT WORKS. FOR SALE IS ONE ( 1 ). ONE STAR IS WORN OUT REQUIRING REBUILD OR HEAVY REPAIR. Improved sleep mode for long battery life. Fluke LVD1A Volt Light. Model: LVD1A. Order No: LVD1A. Detector glows red when it is at the source. Local pick up is not available. All orders are checked and inspected in order to ensure the best quality. This is a complete set of Catu 1000 volt insulated tools. Seven Catu flat head screwdrivers ranging from large to small (part #: MO-65211, MO65209, MO-65207, MO-65206, MO-65205, MO-65204, MO-65203). SimpliFiber® Pro boast industry-leading functions such as dual-wavelength testing and automatic-wavelength detection, in addition to unique features such as CheckActive™, FindFiber™, and Min/Max. SimpliFiber Pro singlemode 1310/1550 laser light source. NOTE: I can custom make almost any extender board. With basic information about the extender you need I can program the automated CNC machine I have to produce what you need. This kit has all that is needed to building a working extender board. DIL10 / DOL10 Data Cable Output Connection. Pull-Up Fixture. Fixture Only - No Cables. We are not open on weekends. This is what we do, and we try to do it with excellence and integrity. Hard Copy Manual. Details on this Manual: Used, see picture for condition. New $199 each. Quantity 2 on hand. Each $120.00. Model: L210 Includes a Fluke L200 Probe Light and Probe Extenders. Fluke L210 Probe Light Kit. Model: L210. Order No: L210. Includes L200 Probe Light and TP280 Test Probe Extenders. 8" probe extenders keep hands away from live circuits. THIS IS A WORKING FLUKE 1910A MULTI COUNTER. WE ARE LOCATED AT 3521 VICTORY BLVD STATEN ISLAND NY 10314. 8AM TO 4PM SAT. Fluke PV350 Pressure Vacuum Module. Model: PV350. Order No: PV350. Compatible with all Fluke and most popular DMMs. Compatible with all Fluke and most popular DMMs. Transducer sealed in 316 stainless steel compatible with variety of liquids and gases. Any cosmetic wear is pictured! Nothing else is included that is not pictured! All of my items are guaranteed to work unless stated otherwise in my listings. Thanks! 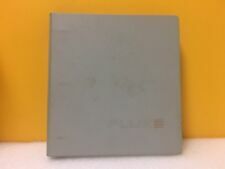 Details on this Manual: Used, operations manual. Hard Copy Manual. This is what we do, and we try to do it with excellence and integrity. Hours of Operation. Our 30,000 Sq.Ft. Model: 373837. MPN: 373837. We're down to earth, easy to work with people. PRODUCT INFORMATION. Fluke LVD2 Volt Light. Model: LVD2. Order No: LVD2. Local pick up is not available. Fluke FLUKE-3PR Fluke 3 Point Laser Level Red. Condition is New. Shipped with USPS Priority Mail. The Fluke LinkRunner AT-1000 is an Auto Network Tester (LRAT-1000). Verification of Ethernet on copper or fiber up to 1 GB/s.